Met up with Kelvin and Mr Sotong Bao again for dinner along with my gf. Our initial location was supposed to be at either a porridge buffet in Ang Mo Kio or a HDB Tai Tai recommendation called Bermuda Triangle around the area. However, they were not viable options as they were packed and so we traveled around searching for food till we found this place. Cosy, quiet and small are the words you would use to describe the restaurant. Also to note was that the place was packed when we arrived. A good sign? Not in terms of service thats for sure, we had to wait about 10-15 minutes before our order was taken and table cleared. Cheese and Tomato Bruschetta ($6.50) - Toasted bread with tomato and cheese. This has got to be a cruel joke since there's practically nothing worth merit on this item and its a complete waste of money. Next! Haloumi Cheese ($6.50) - Deep fried cheese with tomato pizzaiola sauce. Personally, i've never had this before and after this, i probably will not order it again. Cheese was tasteless and forgettable. 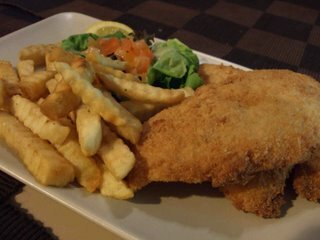 Fish And Chips ($9.50) - The biggest of the lot in terms of main course servings. The owner was kind enough to point out that this is a dish for kids and seldom ordered for adults. The fillet was crispy and batter thin but the meat wasn't fresh and was generally tasteless. A point to note though is that, for a kids meal, the serving was a whole lot more then any of the other adult items we ordered. Maybe kids have it better? Beef Stew ($19.50) - It came smelling fragrant but won't win any prizes for presentation. Beef was tender and quite sweet tasting but its more like a non spicy rendition of beef rendang. Not too bad but portion was small and definately not worth the money. Grilled Chicken in Mushroom Sauce ($15) - My gf had this thinking it would be a healthy and light dish but it came swimming in olive oil. From the outset, it was oily and that signed the death warrant for this dish. The grilled chicken was oily AND tasteless. Bad move. Tiramisu - Madam Q's signature dessert. Tiramisu seems to be a favorite order such that almost any eatery will have it simply to round out their menu. This rendition was at least decent in that it was sweet and the cake was evident though i do not detect much rum. The best item of the day but thats not saying alot since everything else bordered on failing. $85.80 for a mediocre meal is just one meal too many for me. Disappointment. For all the good service and nice ambiance going for it. All this places lacks is good food. I went back again when there were less people. Food is slightly better than the previous time, but still not up to standard. Haha. So the conclusion is still not to visit again then. On my last visit to Romano Ristorante, I spotted this restaurant going by the name of Madam Q Steakhouse just next to it and with a large placard outside advertising its set dinner for only $18.90 . That was good enough reason for me to return just to try it out. Ironically, I didn't order the set menu and neither did my dining companions as it didn't really look very appetising. That aside, the place was simply done up but rather tiny and not to mention noisy with all the incessant chatter. What I liked about it though, was its dim lighting and nice cosy corner bench like seats which came with cushions. 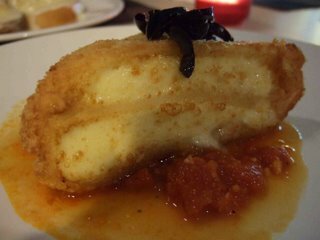 Haloumi Cheese - Deep Fried Cheese with Tomato Pizzaiola Sauce - What started out as a potential drool inducing dish was nothing more than a farce. The cheese was way too chewy and bland to be even considered cheese. On top of that, the batter coating, though crispy, was a little too thick for my liking. Overall the whole dish was a joke. Nowhere in comparison to the excellent rendition that Senso dishes up. Cheese and Tomato Bruschetta - Toasted French Bread Topped with Tomatoes and Cheese - Another joke if you ask me. 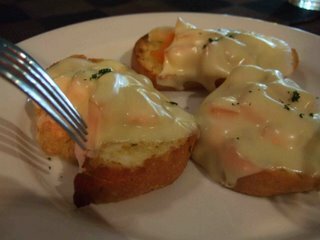 The bruschetta was nothing more than a slice of toasted baguette topped with tomatoes and then covered with a layer of melting cheese. Tasted like it as well. I'm pretty sure I can do this easily at home myself and not even have to fork out a third of the price that it goes for at Madam Q's. 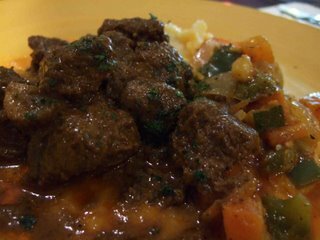 Beef Stew "English Style" - Beef Chunks Stewed to Perfection, with Mashed Potatoes and Carrots - First of all, I can't claim to know what exactly constitutes "English style" beef stew, but I have eaten enough beef stew to know that this one wasn't exactly stewed to perfection. For one, the beef chunks were a wee bit too soft and didn't come across as very fibrous. This dish kinda reminded me of beef redang, minus the spiciness. Decent dish though. Barracka Chicken - Chicken Breast with Garlic sauce, Sauteed Potatoes and Vegetables - The chicken breast was a little too over grilled as evident from the charred bits along the edges. Even with the garlic sauce, the meat was still tasteless, which goes to show how strong the sauce was. To give it credit, the meat was still decently tender and succulent but portions could have been bigger. Fish & Chips - The dish with the largest serving of the day, the humble fish & chips. Incidentally, it was probably one of the most value for money dishes that evening. Two large slabs of not exactly very fresh fish coated in decent batter, deep fried and then served with fries and vegetables. Ironically, this dish was meant to be for the kids, as told to us by the friendly owner. Grilled Chicken in Mushroom Sauce - Grilled Chicken Thigh served with Pasta in Mushroom Sauce - Oily oily oily. That was the first impression I had when I saw the dish. The pasta was literally laden with excess olive oil and it reminded me of eating Hokkien Mee sans the Wok Hei taste. The grilled chicken was bland, just like the Barracka Chicken. A most disappointing and unhealthy dish if you ask me. Tiramisu - I have come to realise that many eateries claim the Tiramisu as their signature dish, which really makes you wonder about the standard of Tiramisu nowadays. For a steakhouse, Madam Q's Tiramisu was actually quite decent, or more appropriately, the star of the evening (Not that it was excellent or anything close. It just happened to be the best amongst the myriad of mediocre dishes). For once I could actually taste the sponge yet at the same time enjoy the light as air cream. A note on the excessive sprinkling of chocolate powder atop though. I almost chocked on it. Although prices were rather inexpensive, standing at about $86 for 4 pax, we were barely full after the dinner and not the least bit satisfied with the quality. Service was good though, especially with the affable boss walking around to make small talk with customers. But service only forms a smaller portion of the equation. Quality of food takes up the rest. 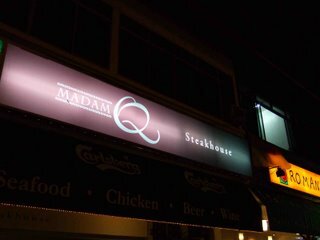 At the end of the day, is Madam Q really a steakhouse as its name suggests, or is it an Italian restaurant, as characterised by the type of food it serves? I really wonder.